We recently got this amazing, MASSIVE fiddle leaf fig tree for the studio at a local nursery. I knew we wanted to use a basket for the planter because I love the texture and baskets are so much more affordable than huge planters. 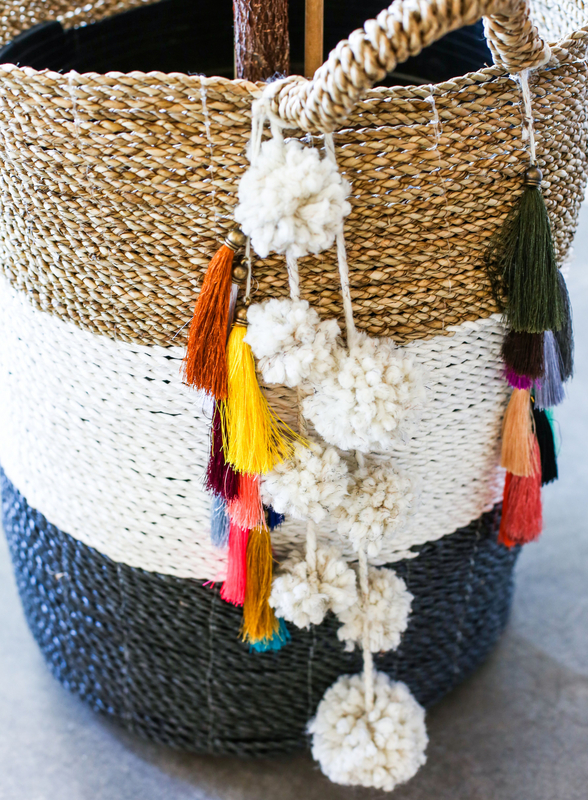 If you’re looking for a fun and simple craft project to liven up your basket planter or to drape on your mantle or tree around the holidays, today’s tutorial is just for you! 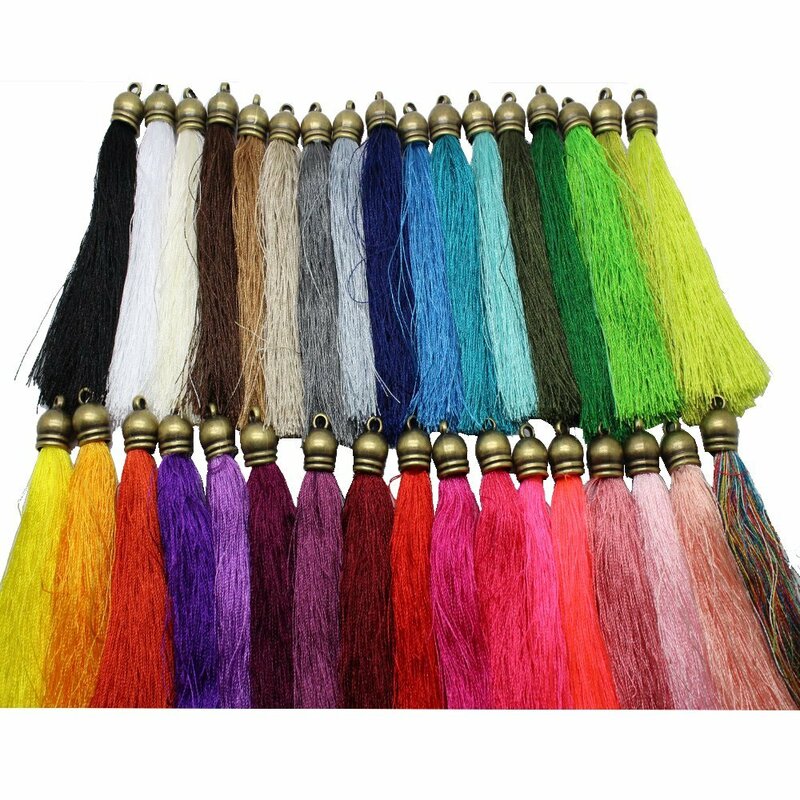 We bought a pack of these tassels and a pack of these as well. It was nice to mix the two sets for variation in size and color. 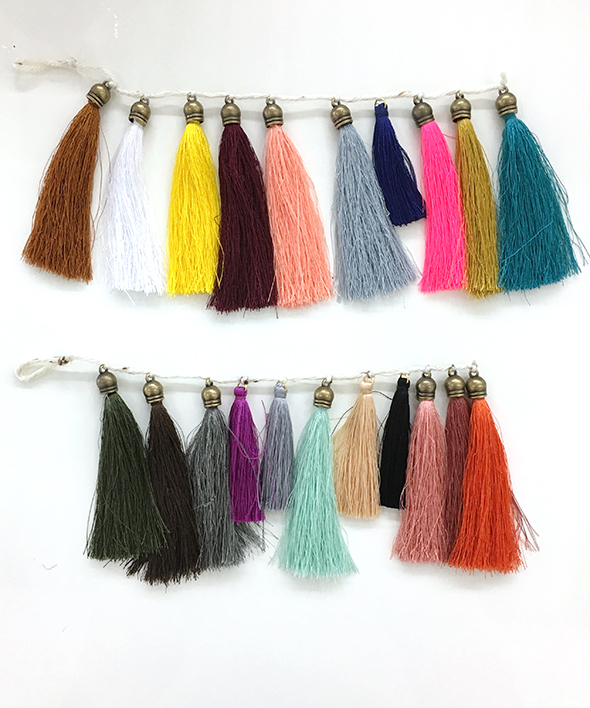 They’re affordable and you’ll have enough to make quite a few of these little tassel garlands! 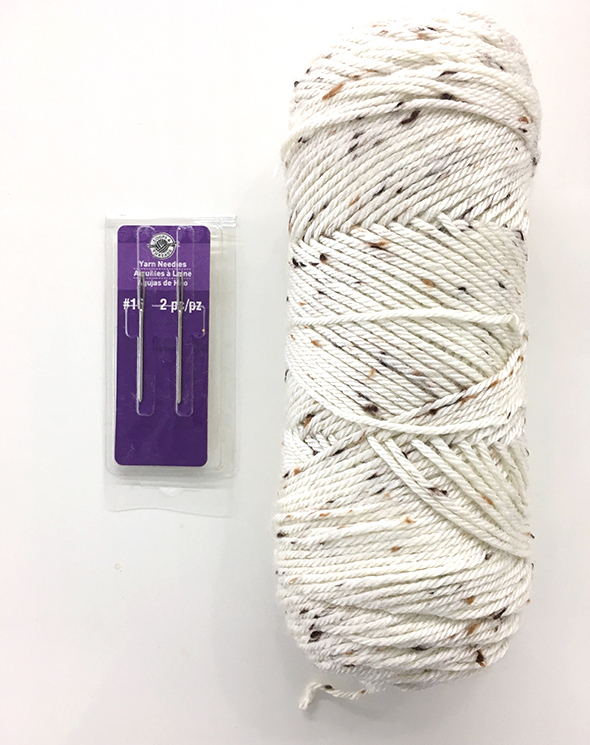 You will also need a ball of yarn and yarn needles. We used a cream color, but feel free to use any color you’d like! 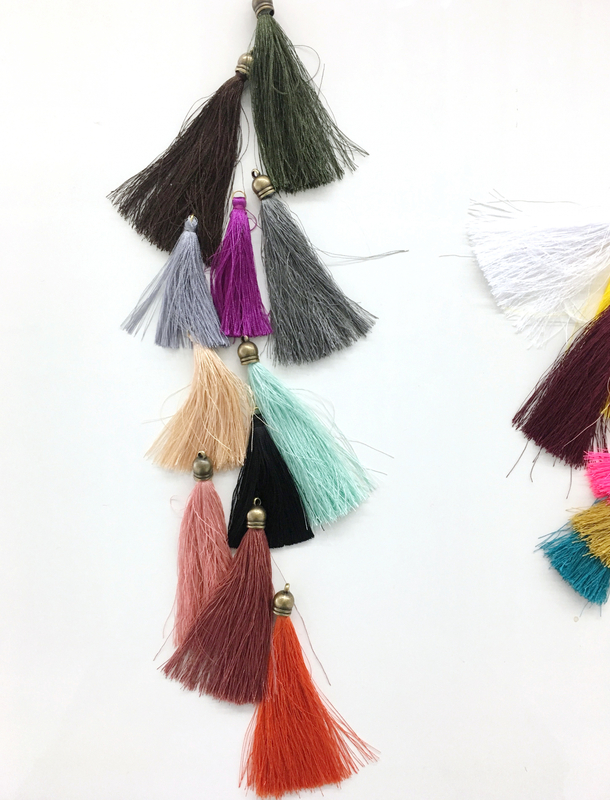 Start by laying out your tassels to get the color combination you’d like. This will make it so much easier when you go to start assembling them! 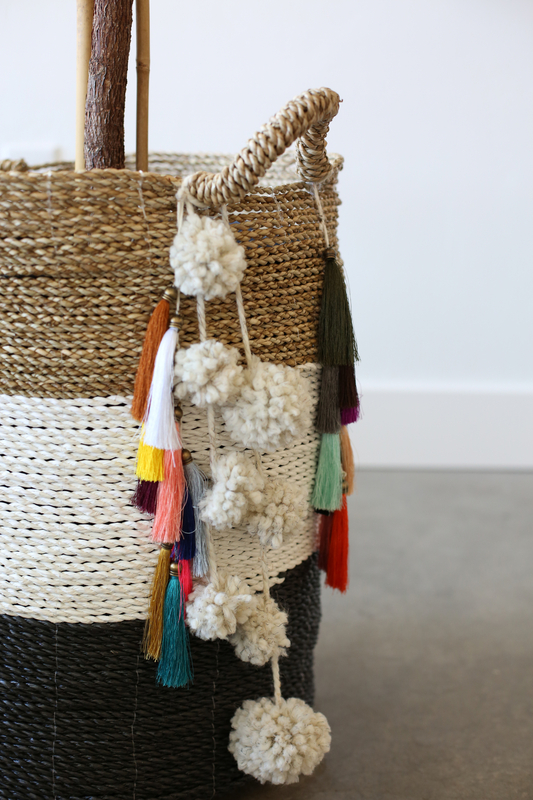 I recommend using about 5-10 tassels per bunch, but you can adjust the amount based on the size of your basket. 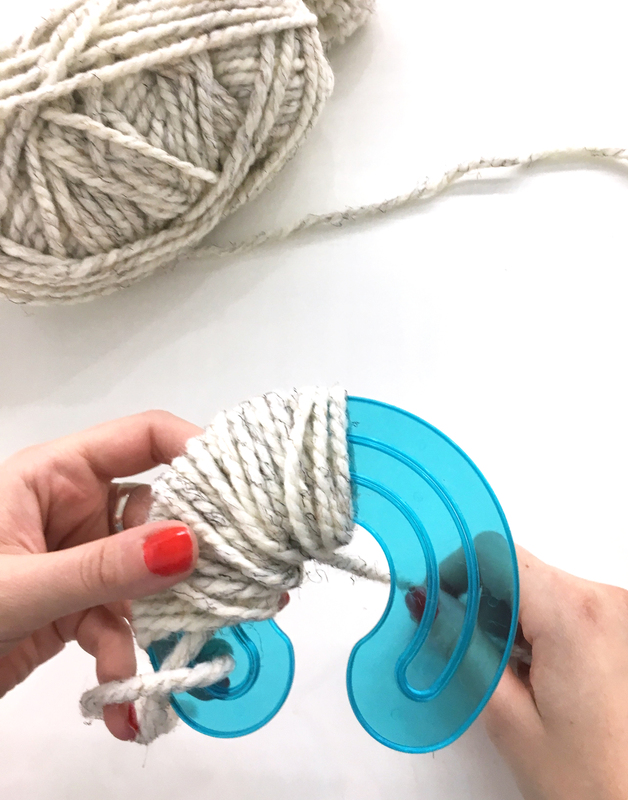 Next, you will want to cut about a 2ft piece of yarn. 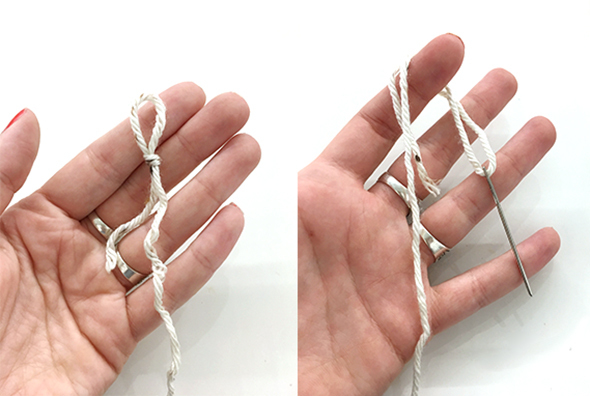 Tie a knot at one end and then thread your yarn needle onto the other end. 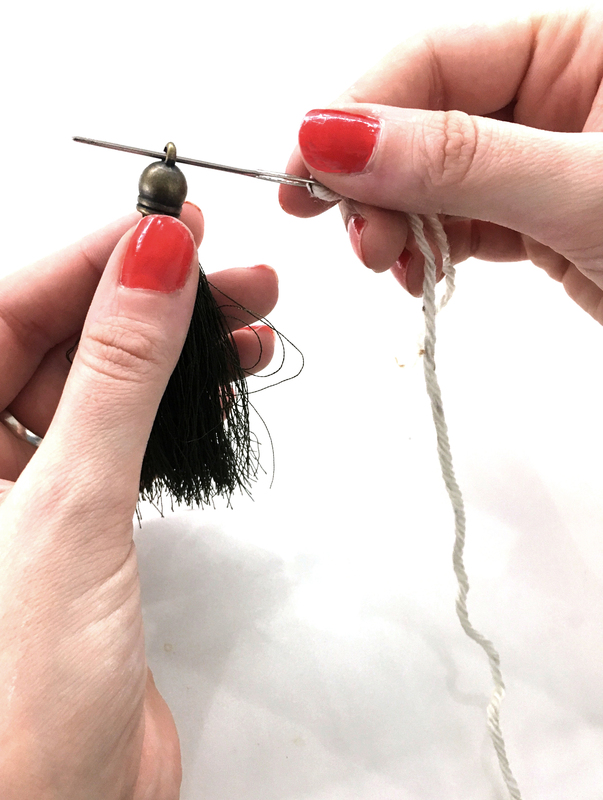 Thread your first tassel onto your yarn and then tie a knot to keep it in place. 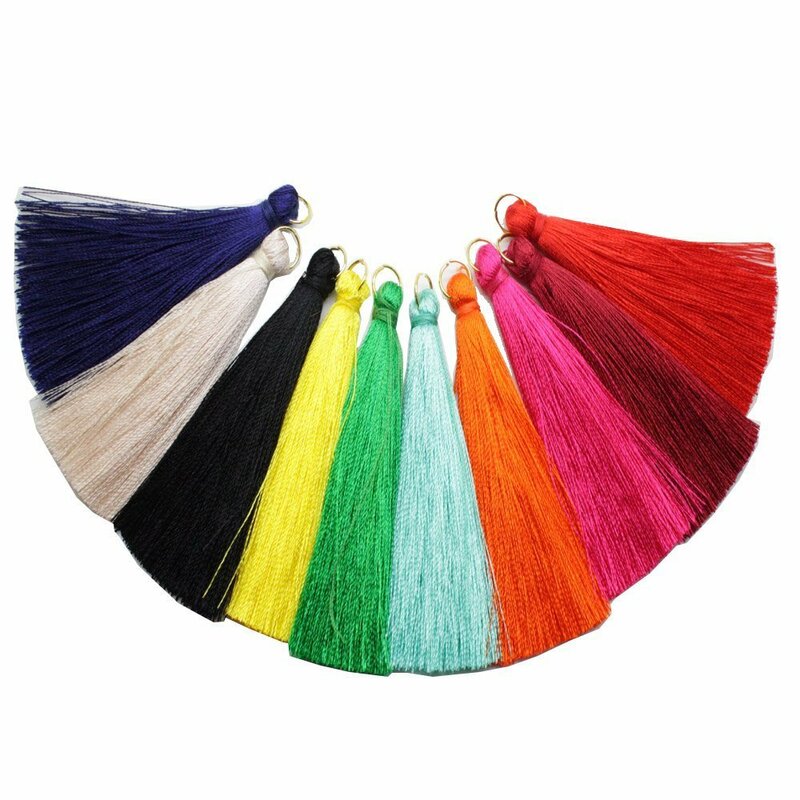 Continue on as you work your way through the tassels you picked out. 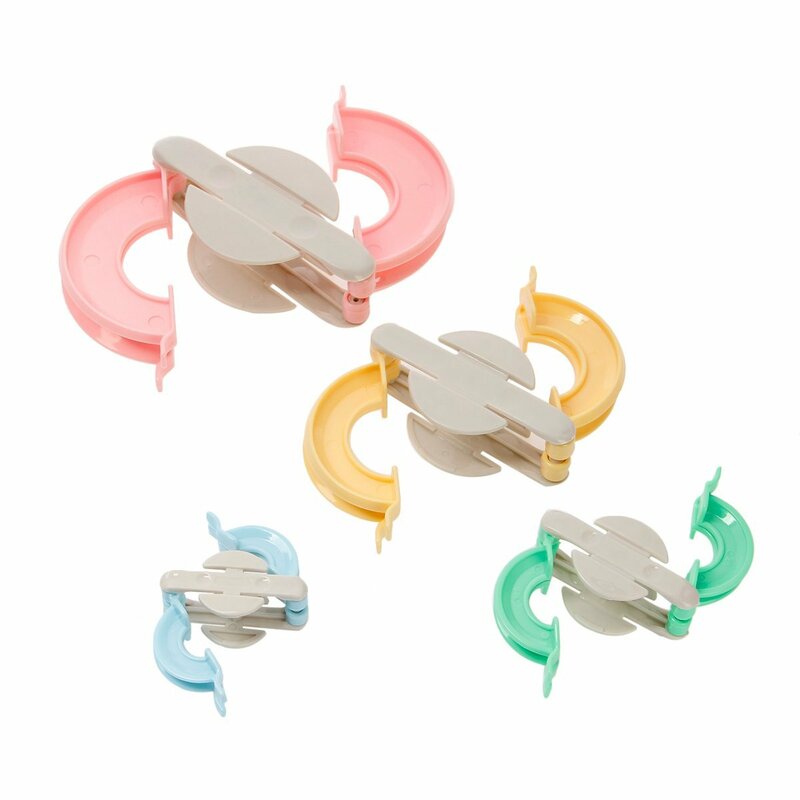 You will want to separate them by about 1/2 inch, tying a knot to secure each one. 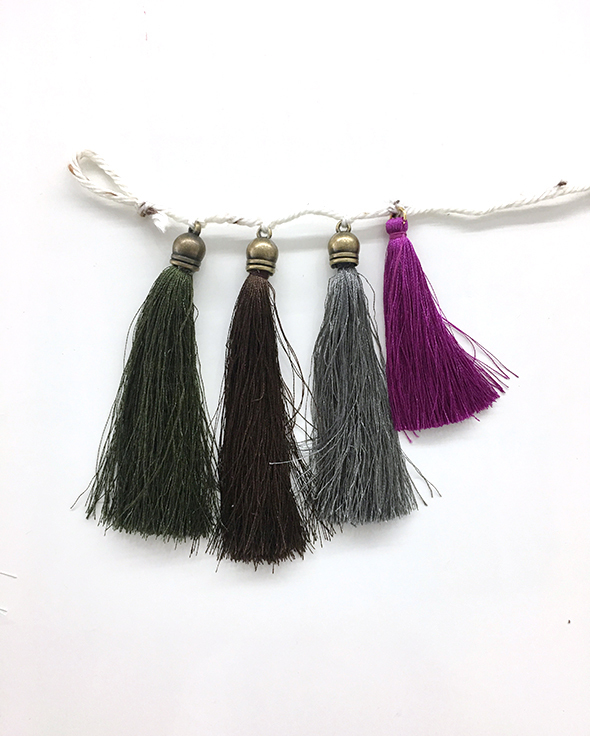 If you want the tassels to be a little more sparse, you can space them out more. Just be consistent about your spacing! When you finish, they should look like this! Now just pick them up by the top knot and they should all just fall naturally into place! 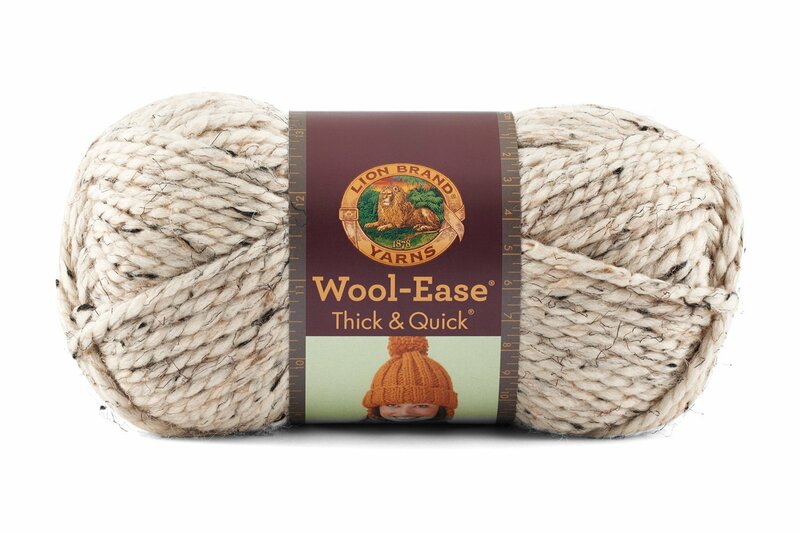 We used this super thick yarn to give them a really full texture. 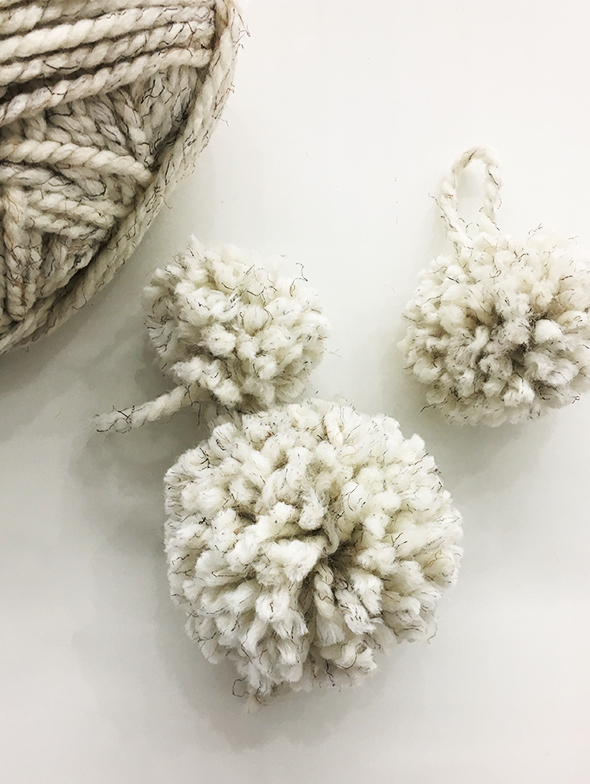 You can use a regular yarn, but the pom poms won’t turn out quite as fluffy. 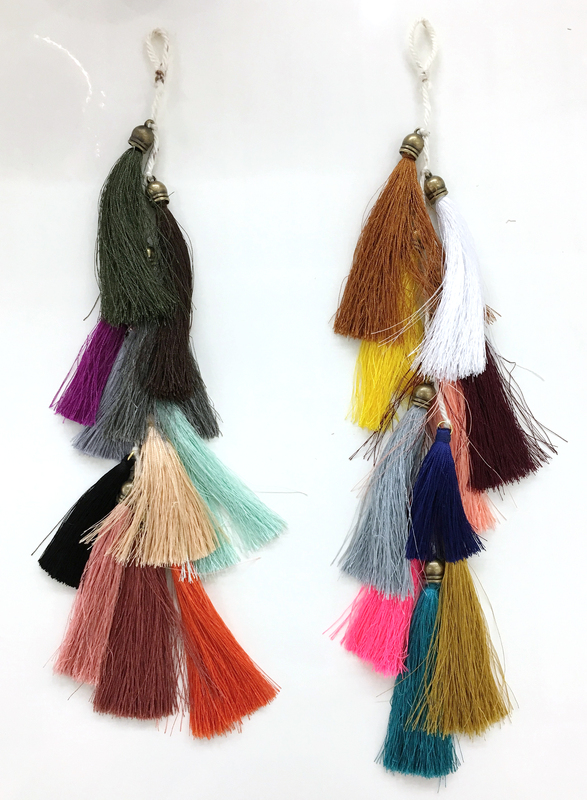 We already had some of these super cool pom pom makers, but we were able to find a few similar versions online. These things are the best! 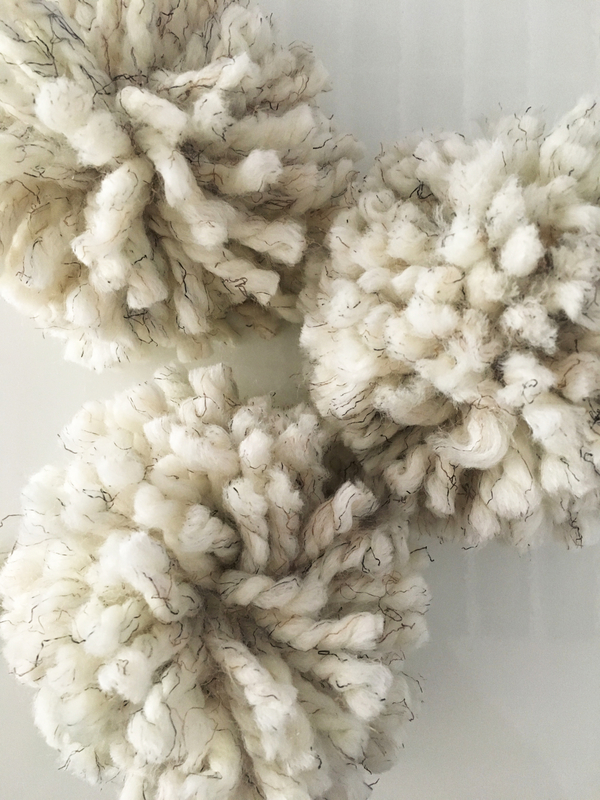 It might take one or two tries to get used to how it works, but once you figure it out you will be a pom pom making machine!! 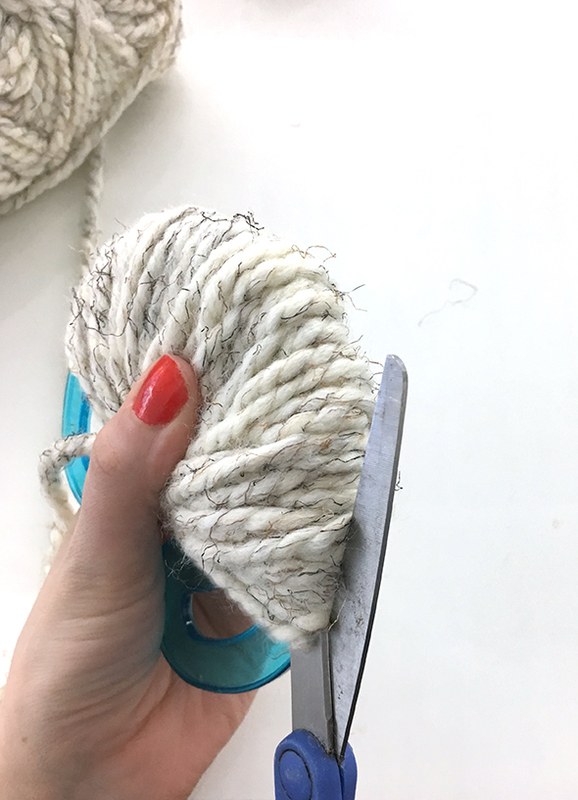 The instructions may vary a tad depending on which kind you get, but essentially you wrap your yarn around the tool, tie it off, then trim the ends and voila, pom poms!!! 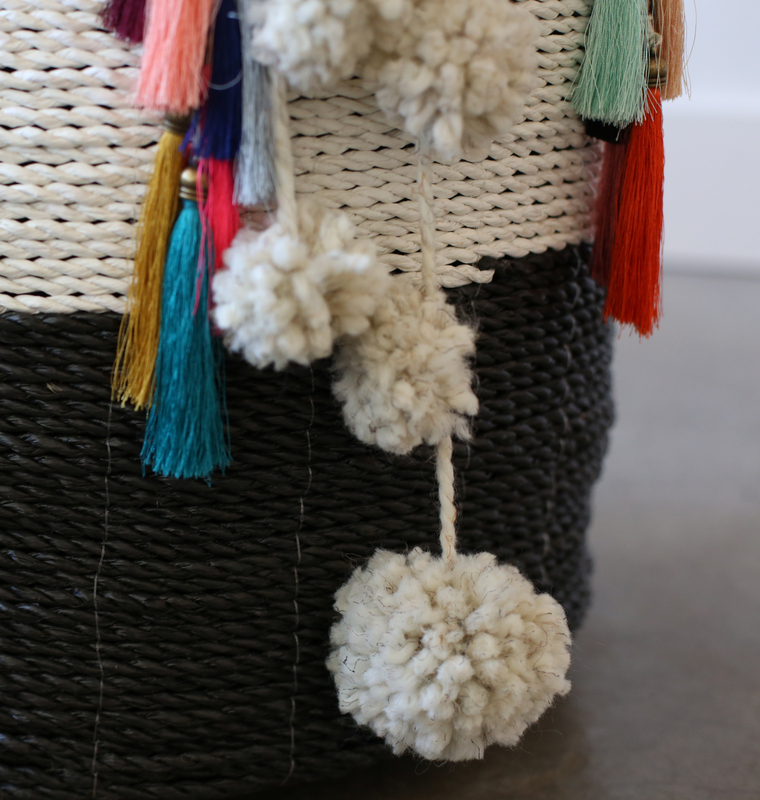 We used eight pom poms for this project in varying sizes. 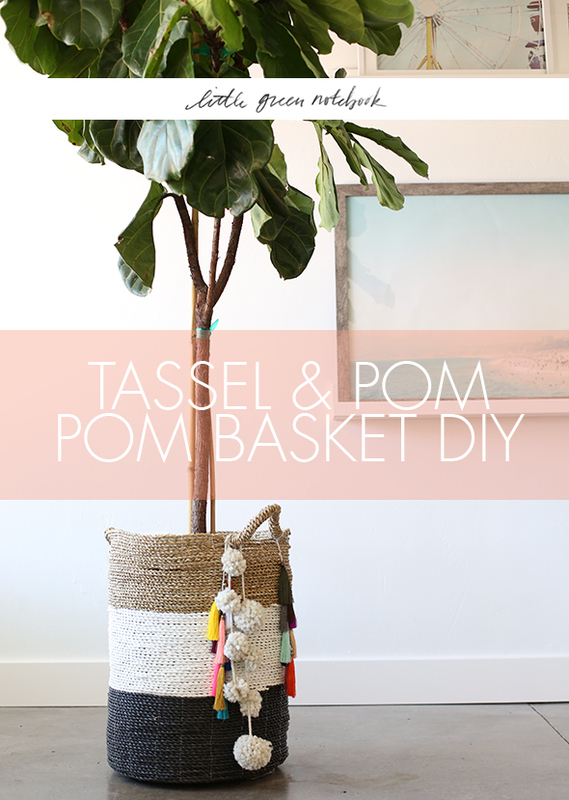 You can tie your pom poms together like we did, or hang them off the basket individually. It’s hard to make these not look cute! 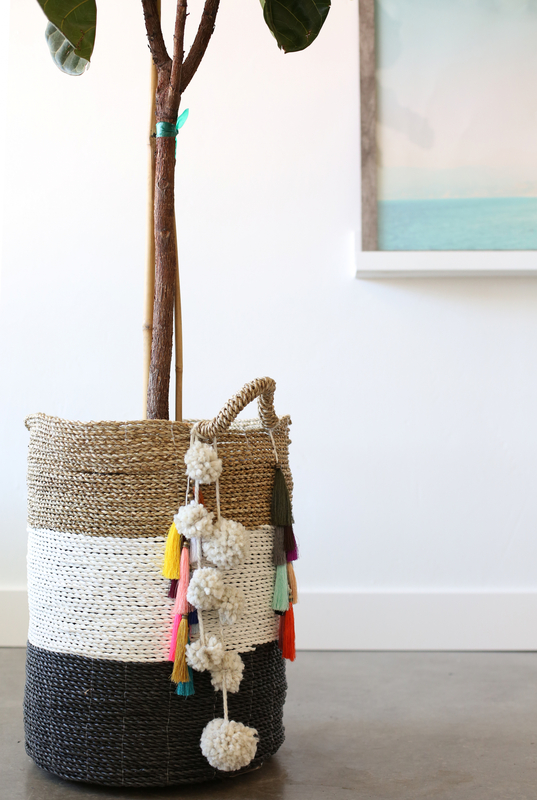 We simply took all of our strands and tied them around them around one of the handles of our basket. If your basket doesn’t have handles you could use hot glue to attach them to the inside of the basket and have then drape over the side. 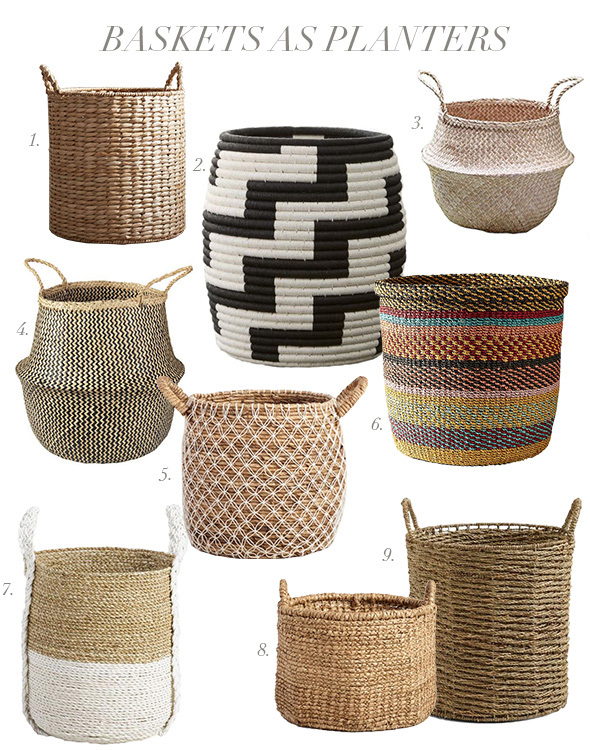 There are bunch of great baskets that can be used as planters out there. Below are some of our favorites! 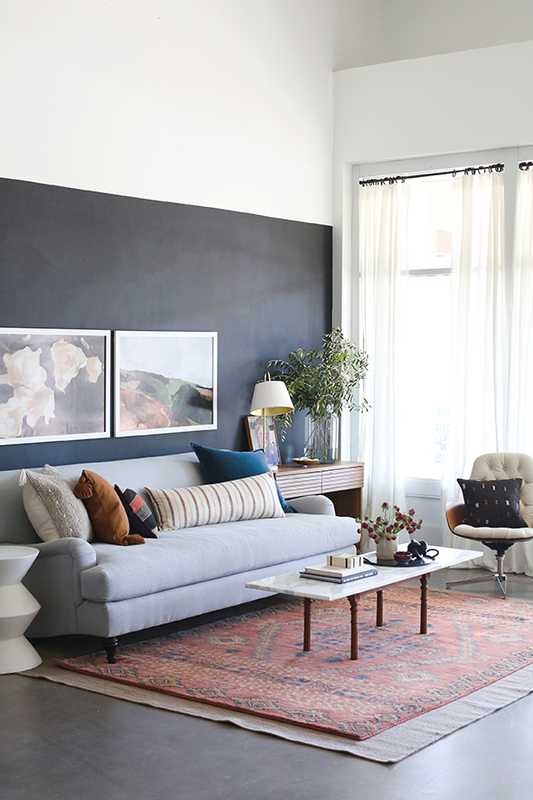 Trying this DIY? Don’t be afraid to go crazy with the colors! We would love to see what kind of combinations you come up with! Tag @juniper_studio in your pictures! P.S. 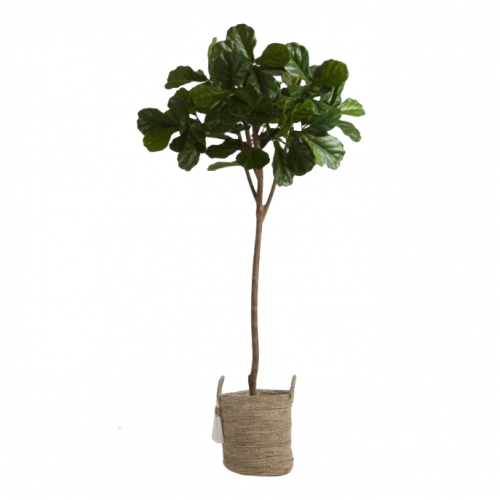 Having trouble keeping your fiddle leaf fig alive? (you’re not alone…) When I bought this new tree, I told the nursery owner I have a terrible track record for killing these trees. He handed me a bottle of this liquid plant food and said it would be a game-changer! 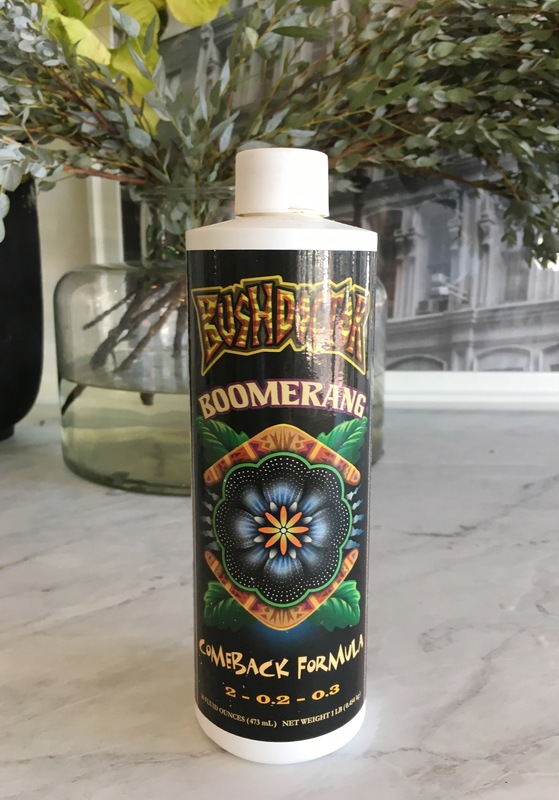 We have been watering our giant tree religiously with this concentrate and our tree has stayed happy and perky! So far so good. Maybe I have reversed the curse? P.P.S. Still think even our super magical plant food won’t keep your fiddle alive? Check back next week for a full round-up of faux plants, including a few fiddles! :) We found some great ones! 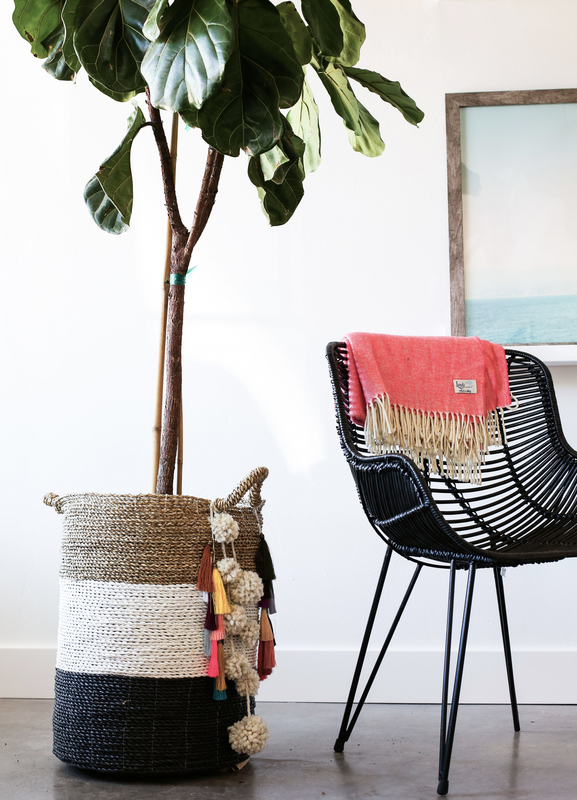 UPDATE—- A lot of you have been asking about how we care for our fiddle leaf fig! We water it once a week with this plant food and rotate it each time. This helps make sure that it’s receiving an even amount of sunlight. The instructions on the plant food call for 2-4 teaspoons per gallon of water. We have a gallon container that we make up and use about 1/3 of it each time we water. Super easy!! The water will run through the plant and pool on the floor. Luckily for us we have concrete floors so this isn’t an issue, but if you are concerned about water getting on your floor we would recommend bringing your plant outside or into your bathtub/shower when watering. Hope this helps!!! Let me know if you have any more questions!! Thanks for sharing, these are so cute and easy! 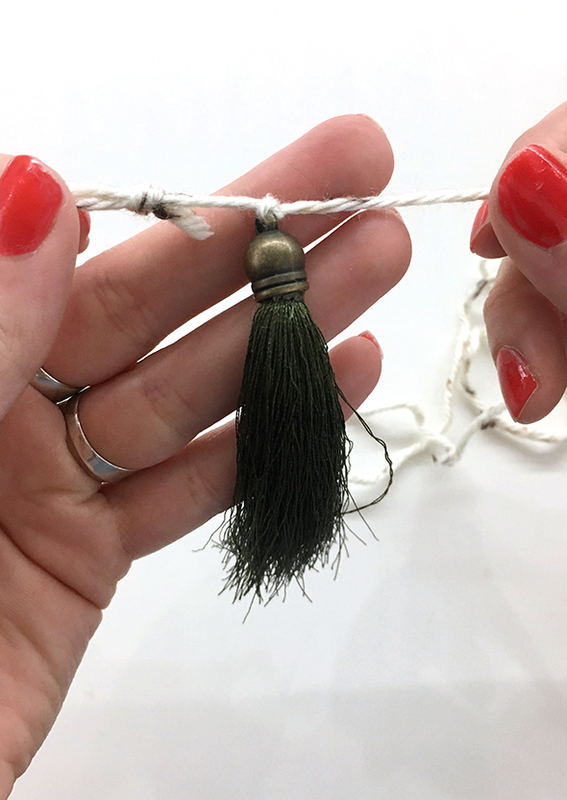 Quick ?, how do you tie the Pom poms together to make the long strand? The basket looks lovely, very boho. I like the idea to put my plants in basket that has some fabric on it. Very different thanks for sharing. Do you line the interior of the basket with plastic? How do you avoid leakage into the basket or on the ground when you water them? I want to do this but I’m so paranoid about water damage on hardwood! Adeline- just put one of those clear plastic trays under the bucket at the bottom of the basket to catch the water. 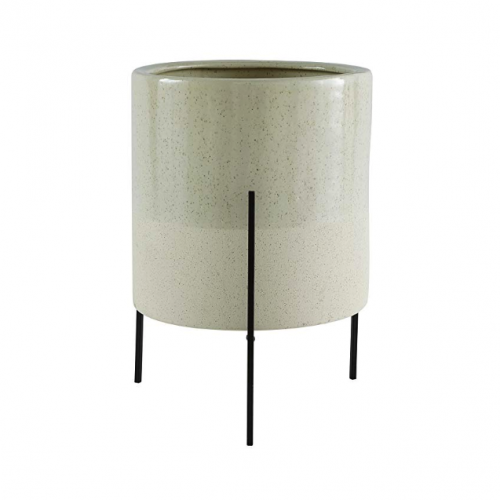 So wish I would have seen this post last week – I just spent $$$ on a large planter for my zz and this is so much more chic. Hey! What local nursery did you pick this up at? It’s beautiful. I’m local and am always on the lookout. I’d love to know. I love your basket. Where did you find it? Might need to try that fertilizer. I use Miracle Grow. I cut mine back in May and it has NOT GROWN from where I cut it. I don’t know why ;( It’s still green though so I haven’t killed it. 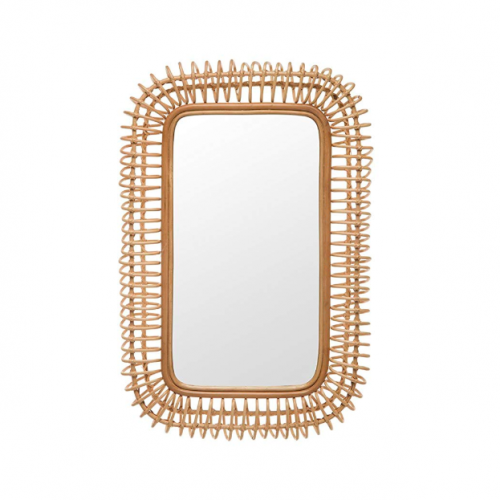 Your plant baskets are really beautiful and it’s a great idea to grow plants in these beautiful baskets. 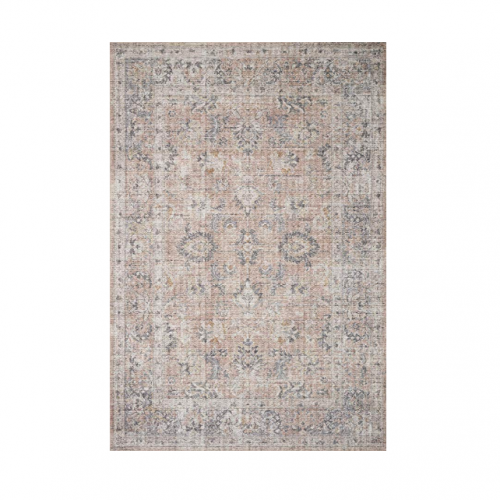 It will look wonderful in our garden as well as for indoor plants. I love these but the fist thing that comes to mind is “CAT TOYS!” My 2 kitties would love to tear these up the minute I put them on the basket…LOL! Thanks for sharing Jenny!! I bought the boomerang to see if it can save my fiddle. I have a huge tree and it has lost quite a few leaves, but I’m hopeful that it won’t die, I have had it for at least a year and it’s still kicking, wish me luck! How much water do you give your tree out of curiosity? Hi, the Carnival print is still showing as $15 in the shop? I’d love to know your thoughts on wide plank (7.5″) solid hardwoods vs. engineered. I saw the ones you linked to are engineered, as are the majority i see most designers use. 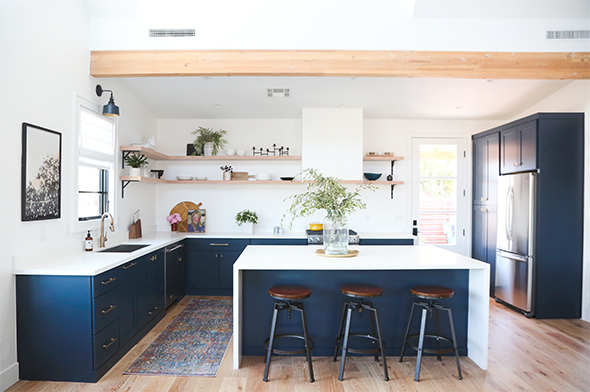 We are building a new home and I really want this look but we prefer the feel and longevity of solid wood but our builder keeps telling us anything over 5″ will buckle over time with the change of heat and air during the seasons. Obviously we don’t want that! Thanks! Your plant baskets are really beautiful and it’s a great idea to grow plants in these beautiful baskets. I’m local and am always on the lookout. I’d love to know..